It’s been a while since I posted a new recipe…life’s like that. I cook because I have too and I try my hardest to turn it into something I love to do and live, breath and find all-consuming aka Nigella and Jamie….but for me, cooking is often just a chore at the end of my day. Not always a chore , mind you, but I definitely need to be in the right mindset to really enjoy it. Saturday is for some strange reason, the day I mostly get a kick out of cooking. Maybe it’s because I feel most relaxed on a saturday and can feel guilt free about fiddling around the kitchen and not painting or running around after the girls. Maybe it’s because I sometimes, just sometimes, get a sleep in – like today (bliss) and feel more energized to be in the kitchen. I do not know, but when I get the zing to cook I just do it! We have a crowd coming monday night. My brother Ant and his gorgeous wife Kaz and my nieces Bee and Dee, fly in from Dubai tomorrow and its Kaz’s birthday, so we are having a family get together before we head to Rottnest for Easter. I’ve made a huge chicken curry and a cheesecake. This cheesecake is amazing! The simplest, yummiest, cheating cheesecake ever and one of my standby, bring a pudding recipes. Thank you Nigella for being a lover of easy peasey, knock em dead, don’t hold back on the fat and sugar content recipes!! Blitz your cookies in the Thermomixer – 10 seconds/speed 5 until fine crumbs. Add in soft butter, cubed and blitz 10 seconds/speed 5 until starting to clump and look fully mixed. Press into base of 20 cm springform tin. Press up the sides to form a very slight ridge. (a VERY small ridge! Dont be tempted to make a taller one… you will thin out your base too much). Insert Butterfly into Thermomixer. Beat cream cheese, icing sugar, vanilla extract and lemon juice – speed 4/ 20 seconds. Scrape down sides of bowl then speed 4 / 10 seconds. Add in double cream, speed 2 or 3 / 10 seconds. Spoon into springform tin, smooth with a spatula slightly. Cover with plastic wrap (not touching the cheese mixture) refrigerate 3 hours or overnight. 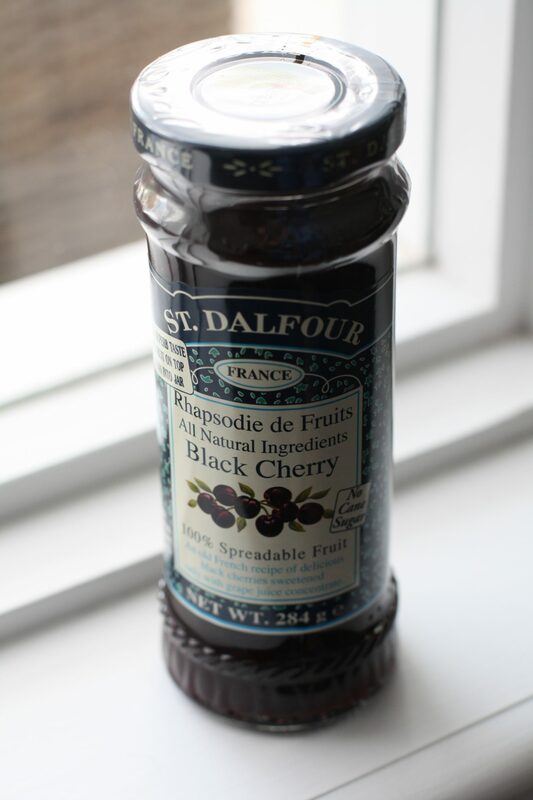 When ready to serve, unmold and spread the contents of the whole Black Cherry jar over the top! Yep! That’s it…simplicity and joy at the pop of a jar of cherry conserve! Eat, enjoy and go back for more…dare you not too! PS. I will post a photo of the finished cheesecake when I plate it up…it is on hold, in the tin, until monday!